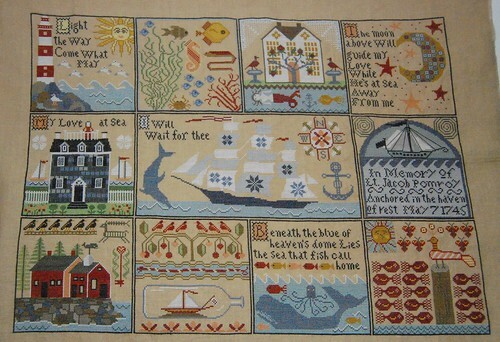 Nicole's Needlework: Shores of Hawk Run Hollow Finished!! Yes!! I just finished it and I'm so glad to be done!! Carriage House Samplings "Shores of Hawk Run Hollow"
Congratulations Nicole! Your finish is amazing !! Incredible, as always! And beautifully stitched. Gorgeous! Was wondering what was taking you so long to post again...now I completely understand. Really, really gorgeous Nicole!!! I love and huge congrats on the finish :-). That is amazing! Great work. Congratulations on your beautiful finish! Mine should have been finished by now Yours is so pretty and I bet you feel so happy to have it done!! I love it. 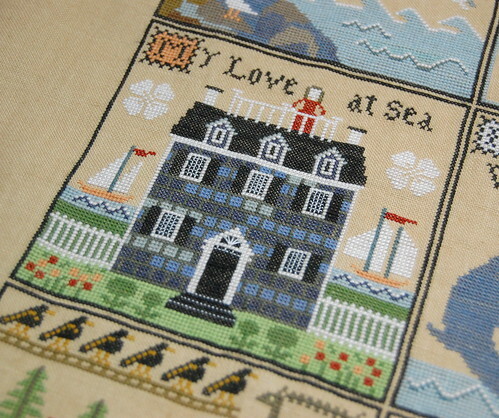 Maybe you can help inspire me to get back to my stitching! Looks wonderful! I think I'm going to have to add that one to my wish-list :D I was wondering if you could share with me your favorite technique for dyeing with the Tan-Rit dyes. I have mostly been using coffee and tea dyeing, but am interested in doing some other kinds. Thanks! Did you say WHEW! when you finish? Stunning!! Wonderful, wonderful, wonderful! It's beautiful. Impressive and fabulous! Must have felt great to finish the last stitch!! AMAZING...I knew you'd do it though...so is this one going in the tub? Wow Nicole. You finished that off in a blink of an eye from your last post! It looks wonderful!! You must be so thrilled! I'm doing a happy dance for you. Congratulations on a great finish. I think the ship in the bottle is my favorite square. Absolutely incredible, Nicole! It is dropdead gorgeous! Congrats on a job well done! Wow!!! It's amazing! Congrats on the finish! What an accomplishment! It's gorgeous! Yippee!!!! Huge congratulations on finishing this spectacular piece! You do such beautiful work - it's always a joy to see! WOW OH WOW!! Congratulations on a wonderful finish!! Can't wait to see the next start! Congratulations Nicole! It's really beautiful. That last bit seemed to go quickly. WOOT WOOT!!! Awesome! Do you feel like you just finished a marathon or something?! What a gorgeous piece of work. Congrats! Huge congratulations on a huge finish, Nicole! It's beautiful! Congrats on your awesome finish Nicole. Congrats, congrats, congrats!!! Absolutely beautiful! It's absolutely stunning. Be proud, very proud. Kudos Nicole! What a great finish... now about that starting something new! I think you have some PS homework to be done first.... happy stitching. Congratulations on such a massive finish! It looks fabulous! Congratulations on your finish...I am so very proud of you...It turn out just beautiful. Oh my goodness, what an accomplishment! Congratulations on a true masterpiece! Yay for You, Nicole!! It is gorgeous, you should be most proud of your accomplishment!!! 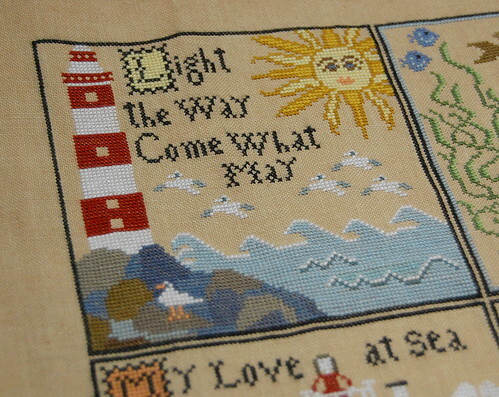 Your stitching is always a joy to see!!! Congrats - it is a fabulous piece. Congrats Nicole, this is awesome!! WaHOOOOOOOOOOOOOOOOO!!! I am so psyched for you, Nicole! It looks amazing. Congratulations, what a great achievement! Congratulations Nicole! Beautiful finish. I like it, I love CHS pattern!!!! Wonderful! Congratulations! You do very nice work. Congratulations on a wonderful finish! I know you feel great to have this biggie completed! This is beautiful and I love your fabric choice! GORGEOUS!!!! Congrats on the finish - I knew you could do it before the end of the month. Congratulations, Nicole !!! You have been so disciplined about stitching The Shores... It is beautiful ! Congrats on the beautiful finish. Oh, Wow, Nicole. I am speechless. What word do I use to tell you how perfect it looks? Great job there. You should be so proud of yourself. Congratulations on an awesome finish! Oh My! I'm catching up on some reading and see your finishes and am so excited for you. It looks fantastic and I'm sure you're excited to have it finished. I don't blame you for wanting a few "smaller" pieces to work on for awhile, not that AotH is small. Congratulations on your finish! I know what an accomplishment this feels like. Are you going to frame it yourself (you're so talented!)? Stunning, stunning, stunning. This is so beautiful, good job!! Did I say this was stunning? Beautiful finish! Your stitching always looks like painting. Very delicate. Congratulations on such a gorgeous finish! This is my favourite of the HRH designs I think.